This figure represents either a Minoan fertility goddess or her Priestess, perhaps a princess. She was found at Knossos Palace by Sir Arthur Evans. She carries snakes as symbols of death and rebirth (from their annual skin shedding). Atop her crown is a lion, a symbol of royalty. 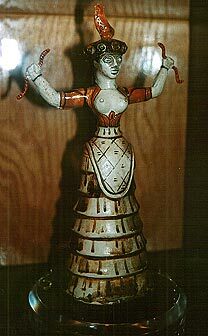 Ringing her crown are poppy pods, indicating the use of opium in her worship. The original is in the Herakleion Museum, Crete.